V+ SuperVruits is a angry-birds-like game for facebook, iPhone/iPad and Android devices. If you win all 25 levels you can win a car or other nice prices. The successful print magazine for business customers of the Telekom gets its own web presence. We wanted to build a state of the art online magazine. Phone with the Klitschkos and see them on the website at the same time – that is “experience what is connecting”. For the business sector of Telekom we developed a game, that links two different channels together to highlight the innovation power of the company. Das GK-Center der Telekom ging vor einigen Wochen online. Dort kann man sich zu vielen Produkten und Themen der Telekom informieren. Es gibt mittlerweile ziemlich viele Inhalte und es kommen monatlich neue hinzu. Das Geschäftkunden-Center der Deutschen Telekom ist kürzlich online gegangen. Das war mein größtes Projekt bisher. Offizielle Webseite des Künstlers Ekundayo. Zusammen mit intoxicated demons habe ich dieses schöne Ding gezaubert. Online portfolio of stylist Paloma. Kleine Fotogallerie mit Arbeiten der NewYorker Fotografin Paloma. 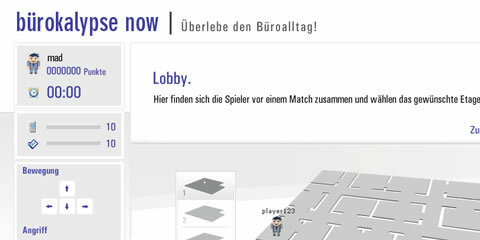 Schönes multiplayer online Game für zweimaleins. Beliebig viele Spieler können in diversen Levels gegeneinander antreten und nebenbei chatten.